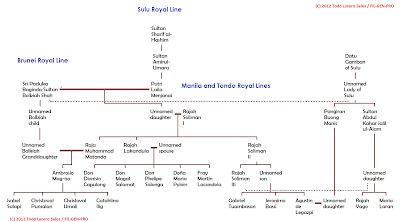 In two previous articles I wrote on Philippine royal genealogies, I discussed the impossibility of the descent of the Laurel family from the Sultanate of Brunei and the interrelatedness of the Sultanates of Sulu and Brunei. In this third article on Philippine pre-Hispanic nobility, we will look at the royal houses of Matanda, Lakandula, and Soliman, whose descendants were considered the cream of the principalia crop. Some writers and researchers have traced the Lakans of Manila and Tondo further than the three big names: Matanda, Lakandula, and Soliman. However, all of these have no archival references making these slightly suspect in terms of its veracity. Some of the sources of these online genealogies were probably from other articles compiled over the years, and while others cite genealogical charts from this and that source these charts themselves do not have any archival basis. In various Wikipedia entries and some other online articles and family tree sites that would all look authoritative to the uneducated eyes, it is generally accepted that Matanda and Lakandula were either first cousins or brothers and that Soliman was their nephew. It is further written that they were grandchildren of the Brunei Sultan Bolkiah, which these articles also claim was the same as the Rajah Baguinda, whose daughter married the man who began the royal dynasty of Sulu. Some also claim he was the same person as Noble Araw, one of the legendary pre-Hispanic rulers of Luzon. In the genealogy above, it must be noted that the genealogies scattered online claim that this Noble Araw was the same person as Rajah Baguinda (or Baginda) of Sulu and Sultan Bolkiah of Brunei. Noble Araw's wife, Lady Maylag, was allegedly the same as Putri Laila Menjanai, the daughter of Sultan Amirul-Umara, who reigned from 1505 to 1527, being one of the sons of the founder of Sulu's sultanate, Sultan Sharif al-Hashim. Thus, using this line of thinking, Rajahs Matanda, Lakandula, and Sulaiman III were all descendants of not only the royal houses of Tondo and Manila but also of Brunei and Sulu. The Houses of Lakandula, Matanda, and Soliman (1571-1898): Genealogy and Group Identity, written by Luciano P.R. Santiago for the Philippine Quarterly of Culture and Society, Volume 18, No. 1, published in March 1990. His primary source came from a bundle of 12 folders from the Philippine National Archives called Descendientes de Don Carlos Lacandola, which contains genealogical data on the descendants of Lakandula as well as valuable information on the lines of Matanda and Soliman. (Personal copy of this author). The History of Sulu, written by Najeeb M. Saleeby and published in 1908 in Manila by the Bureau of Printing. Saleeby's work contained the Sulu tarsila showing the genealogy of the sultants of Sulu. This was shown to him by a former prime minister of Sultan Jamal ul-Kiram II, the last sultan to truly rule with power. He surrendered political powers to the US government in 1915 under the 1915 Carpenter Agreement. (Accessed from the University of Michigan's online library). Silsilah Raja-Raja Brunei, written by Amin Sweeney and Selesilah of the Rajahs of Brunei, written by Hugh Low. A detailed genealogy compiled from both sources (as well as many other sources) can be found in the Royal Ark, maintained by Christopher Buyers. (Accessed from Buyers' site). I have shied away from other sources which did not use any archival or traditional Moslem (use of the tarsila) sources as I wanted to make sure that this discussion would truly give the truth of the ancestors of Matanda, Lakandula, and Soliman as well as show how they were truly related to the royal houses of Sulu and Brunei. How Were Matanda, Lakandula, and Soliman Related? 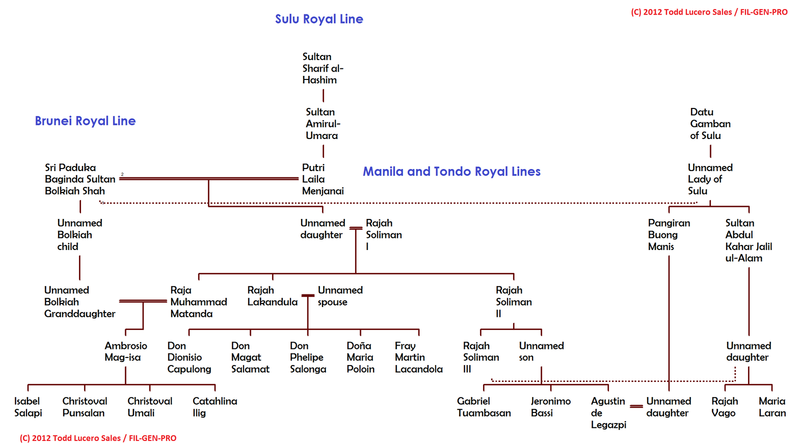 As the family tree above shows, there were several intermarriages among the royal houses of Manila and Tondo, Sulu, and Brunei, and Matanda, Lakandula, and Soliman were descendants of Sultan Bolkiah of Brunei and Sultan Sharif al-Hashim of Sulu. In looking at the previous family tree it is very likely that earlier researchers were confused with the interrelationships of the three royal houses and most likely combined some individuals into one. However, it is now clear that the Lady Kalangitan in the first tree was the same as the daughter of the Datu Gamban of Sulu who was the first wife of Sultan Bolkiah of Brunei. This Datu Gamban must have been the basis of the character of Rajah Gambang of Tondo. Because of their pedigree, the three main focus of this post were all married into the royal house of Brunei. Cases in point were Rajah Matanda, who married a granddaughter of Sultan Bolkiah, his own first cousin; Don Agustin de Legazpi, a nephew of Soliman III, who married another granddaughter of Sultan Bolkiah; and Rajah Soliman III who married still another granddaughter of Sultan Bolkiah, who was the daughter of Bolkiah's successor, Sultan Abdul Kahar.Although it isn't recorded, it is very highly likely that Lakandula, too, married into the royal house of Brunei. Although Rajah Matanda designated his nephew, Soliman III, as his successor, he had a son, called in archival documents as Ambrosio Mag-isa. Although this son never ruled any part of Manila, he had four children who continued the line of Rajah Matanda. All the descendants today of Rajah Soliman III come from his daughter, Maria Laran, as his only son, known as Rajah Vago, was killed by the Spaniards. And of course, the most prolific of the three, Rajah Lakandula had five children, four of which have descendants today. The fifth, Martin Lacandola, entered the Augustinian order to become a priest. Many people throughout the Philippines have, in various points in history, have claimed descent from Lakandula, including the Macapagals of Pampanga, the Salonga family, and some other distant families with surnames with the Dula word in it. So far, none of these claims have archival, verifiable documentation and thus could only be considered as hearsay. Next article: The later generations of the Lakans of Manila.